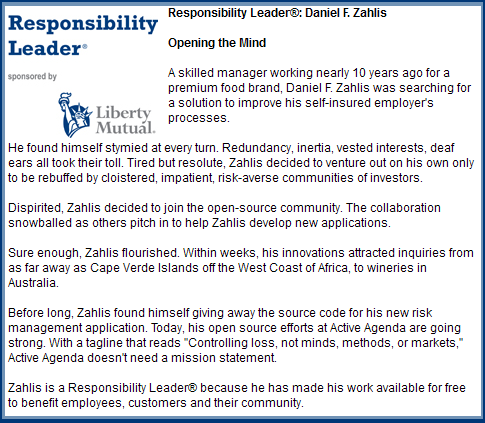 Zahlis is an Enterprise Risk Manager. He has twenty years of risk management experience which includes local, regional, national, and international: risk control; claims management and oversight; program strategy and development; and, enterprise risk management automation. Dan is an award winning author and public speaker in the field of risk management. He has spent the past eighteen years conceptualizing, building, and refining Active Agenda. Dan Zahlis is a native of the San Joaquin Valley of California. He is a graduate of California State University Fresno with a Bachelor's of Science degree in Health Science, Occupational Safety and Health. He attended McGeorge Law School and left before it was too late. Zahlis gained an appreciation for the perspective of the 'front line' while performing a variety of jobs. He worked as a plumber's assistant, boiler repair assistant, retail sales, dredged for gold in the foothills of the Sierra Nevada mountains, and spent summers in Alaska 'sliming' salmon, and operating a forklift on a Bering Sea barge. Zahlis began his career in occupational safety with Chemical Waste Management, Inc. where he worked as a Site Safety Engineer. In his first "real job," he assumed responsibility for the safety and health of the nation's second largest hazardous waste treatment, storage and disposal facility (TSDF). The difficulties of protecting personnel in this hazardous and challenging environment caused a revolving door of immediate supervisors, providing Zahlis with early leadership development - by fire! While at Chemical Waste Management, Zahlis gained an early appreciation for the challenges of operating in a highly regulated industry. He performed the traditional duties of a safety engineer, identified and executed comprehensive industrial hygiene strategies, interfaced with a multitude of contractors and regulators, and provided direct oversight of the workers compensation claims. Dan led the safety and environmental programs for Dole Dried Fruit and Nut division's six manufacturing plants in California. He managed workers' compensation insurance through third party administrator coordination and employee development. He also led the creation and submission of a report to the State of California that resulted in funding for one Deputy District Attorney and one investigator position within the Fresno County District Attorney's Workers' Compensation fraud unit. leadership, management, staff, and line employees on topics relating to risk management practices and team building. He provided staff support to all facilities and management oversight of the company's third party administrator for Commercial General Liability and Workers' Compensation claims. He also challenged the parent company's risk finance allocation system to result in a 2.l million-dollar return to the business unit. While at Häagen-Dazs, he reduced the open to closed casualty claim ratio from 63:37 to 8:92 in one year while establishing a fair but firm reputation for the business unit. 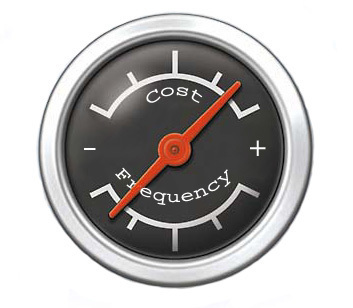 At this point in his career, Zahlis began to crystallize his thoughts regarding organizational performance, strategic change, and the importance of measurement systems which encourage frequency (reporting) as a means of decreasing severity (cost). Zahlis was re-recruited by Dole, in part, to extend his earlier success in achieving sustainable reductions in workers' compensation costs. He helped one facility reduce costs from $385,000 to $30,000 in one of California's most difficult environments. He was also responsible for designing and managing the environmental health and safety, and casualty insurance programs for six facilities in California. His primary focus was on the development and integration of administrative systems for a newly consolidated plant with an emphasis on floor ownership. He managed the division's workers' compensation, general, auto and product liabilities through third party administration. He interfaced with a broad spectrum of regulatory agencies and business process auditors. Zahlis founded Emprise, Inc. following the closure of Dole Food Company’s Dried Fruit and Nut Division. He managed the “tail” of workers’ compensation and select general liability claims associated with the Dole business unit. He developed integrated risk management programs for companies such as Ruiz Food Products and Pirelli Tire. He was also tasked by Dreyer’s/Edy’s Grand Ice Cream to design, develop, and implement the ice cream manufacturer's national risk management process with a special emphasis on process safety management and distributed accountabilities. Zahlis joined a local insurance agency as their Director of Change. He worked closely with agency ownership to transition a traditional insurance agency into a team-based, consultative, risk management solution provider. He agreed to offer Active Agenda as a value-added component of the insurance transaction so long as the Producers agreed to share commissions with support teams. He left the agency after illustrating the effectiveness of the strategy, but before causing a mutiny. Zahlis began a search for institutional money to build Active Agenda. He met with one of the largest insurance brokers in the world on six occasions. He was offered the capital being sought if the brokerage firm could block the insurance market from Active Agenda. Zahlis walked away from the deal and secured angel funding from an investment group based in Switzerland. Within several months, he had signed a Memorandum of Understanding with Munich Reinsurance in Germany. Zahlis began building Active Agenda in 1995. He also began authoring articles on functional integration, operational cost control, preemption of risk, and mitigation of loss. He participates in international Web casts and conducts presentations around the United States on the subject of operational risk control. In 1996, he received the American Society of Safety Engineers' - Veteran's of Safety, Professional Paper award for his work, "CAUTION, Beware of OSHA Statistics". ARCO refineries and the U.S. Paper Industry republished this article. Federal OSHA has cited and included 'CAUTION' as a user resource on the agency's Internet website. In 2005, Zahlis co-authored another 'Cover/Feature' article for Professional Safety titled "Beware the Disconnect". "The Disconnect" was written as a follow-up to "CAUTION, Beware of OSHA Statistics" and provides an explanation for the counter-intuitive phenomenon of increasing claims costs and decreasing injury frequency rates – a phenomenon predicted ten years earlier within CAUTION. Zahlis has been involved in the development, refinement, and improvement of Active Agenda since 1995. He has aggressively sought business alliances with leaders in the risk, safety, and technology domains. He and his partner Mattias Thorslund began seeking sponsors and charter client alliances to bring Active Agenda to the global marketplace as a "free" (open source) solution in 2006. In October 2006, Penton Media published "A Solution (R)evolution" in Occupational Hazards Magazine. "A Solution (R)evolution" is a "softened" version of Zahlis' first hand experiences during his eleven year effort to introduce innovation into the risk and insurance industry. "Occupational Hazards" continued its bold support for the Active Agenda mission by publishing a monthly column about the Active Agenda project. In 2007, Zahlis was named a "FAST 50 Reader Favorite " by the readers of Fast Company Magazine. 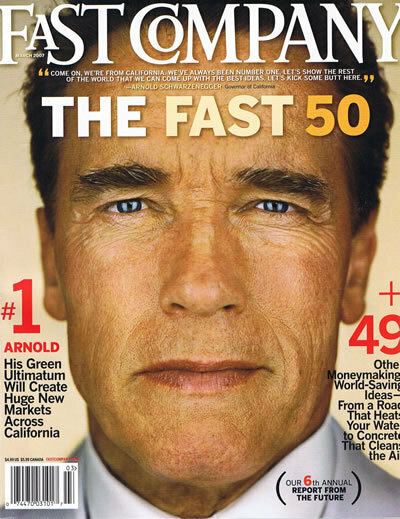 The "Fast 50" is Fast Company magazine's annual readers' challenge, a global search for people doing extraordinary things. "We were looking for innovative talents from the worlds of technology, design, entertainment, consumer goods, science, marketing, media, education, government, and more. Fast Company received hundreds of nominations, which were rated and commented on thousands of times." 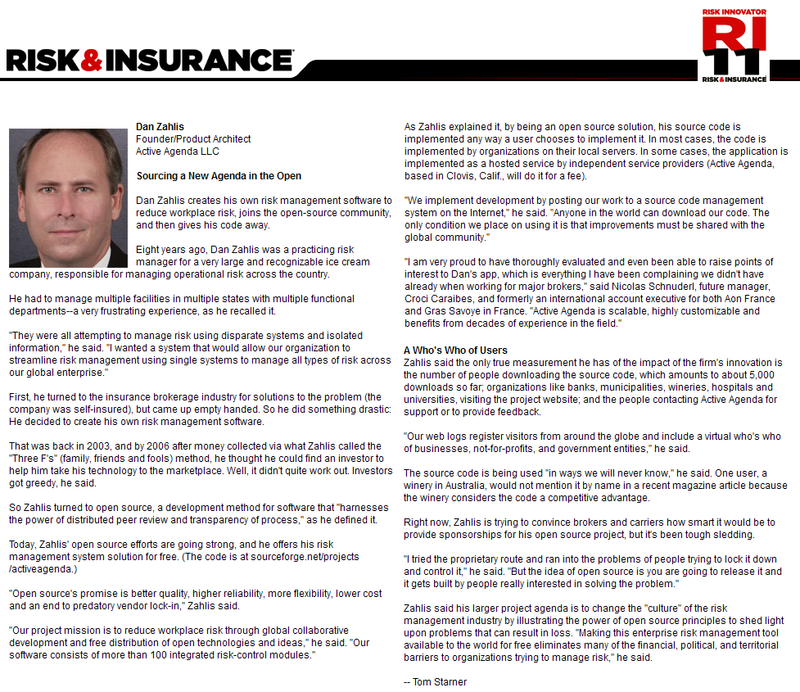 In 2011, Zahlis was awarded the designation of Risk InnovatorTM by RISK & INSURANCE magazine. The Risk InnovatorTM Award recognizes winners across different industries who have demonstrated innovation and excellence in risk management. These key individuals see risk differently and have resolved risk-related problems in a unique or innovative way. Risk InnovatorsTM view risk not only as a threat, but also as an opportunity for their organizations. achievements of his RISK & INSURANCE, Risk InnovatorTM selection. This designation highlights a Risk InnovatorTM whose leadership benefits a company's bottom line, while also making a positive impact on colleagues, customers and the community. A Responsibility Leader® demonstrates creativity, innovation and hard work and their efforts combine risk management success with responsibility. Liberty Mutual's Responsibility Leader® does what is right instead of what is easy. All publications can be downloaded on the Articles page. Mindfulness; EHS Today; April 2009. Suggestions; EHS Today; January 2009. Hazardous Energy; Occupational Hazards; September 2008. Incentives; Occupational Hazards; July 2008. Ergonomics; Occupational Hazards; June 2008. Inspections and Audits; Occupational Hazards; May 2008. Communication; Occupational Hazards; March 2008. Personal Protective Equipment; Occupational Hazards; February 2008. Incident Response; Occupational Hazards; January 2008. Corrective Actions; Occupational Hazards; December 2007. Trust Accounts; Occupational Hazards; November 2007. Gap Analysis; Occupational Hazards; September 2007. Partnerships; Occupational Hazards; August 2007. Implementation Road Map; Occupational Hazards; July 2007. Project Update; Occupational Hazards; June 2007. Chemicals and GHS; Occupational Hazards; May 2007. Hot Work Permits; Occupational Hazards; April 2007. Values and Value Threats; Occupational Hazards; March 2007. Hazard Reporting Threats; Occupational Hazards; February 2007. Introduction to Active Agenda; Occupational Hazards; January 2007. A Solution (R)evolution; Occupational Hazards; October 2006. Added to NASA Headquarters Library. A UNIVERSAL MODEL FOR SAFETY X-CELLENCE; Profits Publishing; Sarasota FL; July 2006. Beware the Disconnect; Professional Safety; November 2005. Cover/Feature article. Thoughts on the Profession...and Making a Difference; Occupational Hazards; January 2004. Passing a Safety CAT Scan; Occupational Safety and Health; October 2005. Ten Ways to Make a Difference; Safety at Work, Australia; March 2004. The Hidden Agenda; Professional Safety; May 1998. Cover/Feature article. CAUTION, Beware of OSHA Statistics; Professional Safety; October 1995. National award winning article. Cited by Federal OSHA on the agency website. Requests to reprint from ARCO Refineries and the US Paper Industry. Mind-Shifting Into Safety Excellence; EHS Today; January 2009. Source of Freedom; ''In The Black", Australia; September 2007. Covenants of the R.O.S.E; Safeguard Magazine, Australia; March 2004. Behavior Based Safety: Myth or Magic? ; Professional Safety; October 2007. The Top 10 Ways to Improve Safety Management; Occupational Hazards; December 2003.